Scooper - Technology News: Are we about to eradicate the first human disease since smallpox? Are we about to eradicate the first human disease since smallpox? Just 22 cases of Guinea worm disease were reported last year, according to the organization founded by former US president Jimmy Carter. According to the Carter Center, there was an 83% drop in cases of the disease between 2014 and 2015. Carter started his mission to eradicate the disease in 1986, and has led the international effort ever since. “This is a very exciting, challenging and sometimes frustrating experience for us,” he said. 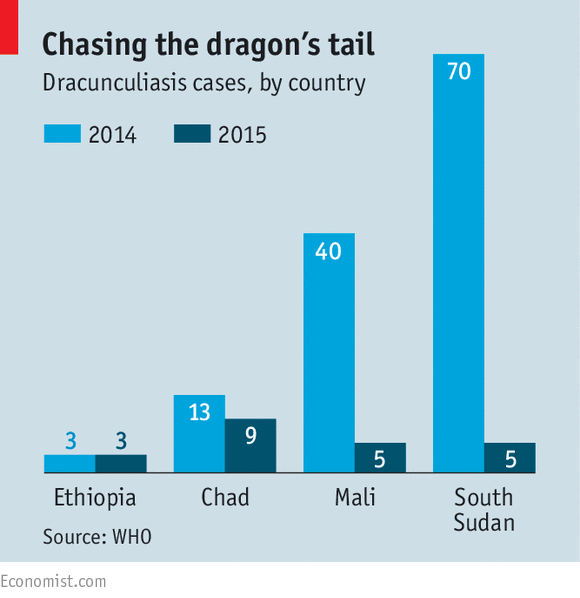 Guinea worm, otherwise known as Dracunculiasis, is carried by tiny water flies that breed in stagnant water. When the water is drunk, larvae enter the body and grow into worms of around a metre long. About a year later, the worm starts to make its way to the skin surface, causing a blister to appear. Although not deadly, Guinea worm is debilitating and extremely painful – the parasite takes between a few days and a few weeks to emerge from the body. The condition can prevent people working or attending school for months. How are close are we to wiping it out? Previously affecting an estimated 3.5 million people a year, in 21 countries in Asia and Africa, today the disease is found in just four countries: South Sudan, Ethiopia, Mali and Chad. Across these nations, only 20 communities still have cases. However, around 4,500 are still being monitored to prevent new outbreaks. "We hope this year we won't have any new cases, but if we do we'll just have to concentrate on those communities," said the former president. Guinea worm would be the second disease to be wiped out. Smallpox was eradicated officially at the start of the 1980s. The world is also on the verge of becoming Polio free. UK International Development Minister Nick Hurd has said that conquering the disease would be “one of the great public-health success stories of modern times". With the rising threat of Zika, and West Africa’s Ebola outbreak still fresh in our minds, the end of Guinea worm would be a welcome reminder that complex diseases can be beaten.